A 16-year-old male presented with a 2-year history of a 5 x 5 cm dermatofibrosarcoma protuberans (DFSP) on the medial aspect of his right lower leg. Wide local excision (WLE) with a 2cm margin was performed and a free anterolateral thigh (ALT) flap was used to reconstruct the defect. This technique satisfactorily reconstructed a large defect in an adolescent with minimal donor site morbidity, as the donor site was closed primarily, and a functionally and aesthetically acceptable outcome. There was no evidence of tumour recurrence at 6 months follow-up. A 16-year-old male presented with a 5 x 5 cm mass on the medial aspect of his right lower leg which had been present for 2 years (Figure A). Three core biopsies of the lesion demonstrated highly cellular tissue consisting of spindle shaped cells arranged in a storiform pattern, consistent with DFSP. No fibrosarcomatous change or malignant transformation was noted. Immunohistochemistry was diffusely positive for CD34 and positive for Factor VIIIa. An MRI of the lower leg revealed a well-circumscribed superficial anterior calf mass arising from the subcutaneous tissue with three ovoid intralesional nodules. No bony, muscular or neurovascular involvement was demonstrated. Surgical treatment consisted of a wide local excision (WLE) with a 2 cm margin, incorporating the deep fascia and periosteum of the tibia (Figure B). A 9 x 11 cm free anterolateral thigh flap was raised on a single musculocutaneous perforator supplied by the descending branch of the lateral circumflex artery of the thigh as pedicle (Figure C). The recipient vessels were the posterior tibial artery and venae commitantes. The flap was tailored to cover the defect, without any tension (Figure D). The donor site was closed primarily. Postoperative course was uneventful and the patient mobilised fully 5 days after surgery. The patient was discharged 10 days after surgery. Postoperative histology revealed clear surgical margins, although the spindle cells revealed mild nuclear atypia and were mitotically active. No postoperative radiotherapy was indicated following discussion at the multi-disciplinary meeting. There was no evidence of recurrence at 6 months follow-up. Reconstructing the defect after surgical excision can be challenging. Options range from simple split thickness skin graft (SSG) to free tissue transfer. Loco-regional and free flaps provide better results than SSG in terms of soft tissue cover, functional outcome and aesthetic results.9 Unfortunately, local flaps can lead to additional scars at the excision site and for this reason we prefer to reconstruct the defect utilising free tissue transfer. As in our case report, the versatility and location of the anterolateral thigh flap makes it well suited for lower extremity reconstruction after both traumatic and oncological surgery.10 It provides robust cover, minimal donor site morbidity as most donor sites can be closed primarily with an aesthetically acceptable scar and better functional outcome than its locoregional counterparts. Although exceedingly rare, DFSP can present as a locally destructive tumour in an adolescent. Early histological diagnosis by incisional biopsy is mandatory, as the reconstruction of the defect after wide local excision can be challenging. Loco-regional or free flaps provide better cover for the defect than split thickness skin grafts. 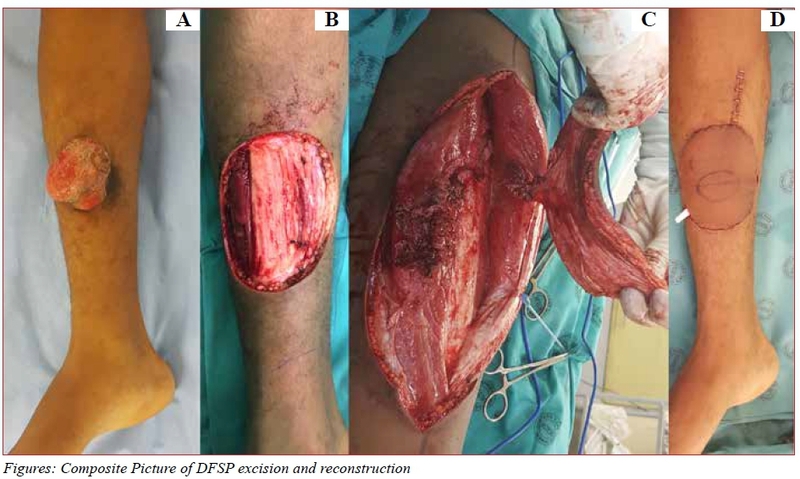 A free anterolateral thigh flap can be successfully used to reconstruct larger defects with minimal patient morbidity and an acceptable aesthetic outcome.